“Where Historical Meets Hysterical!”® Take a lighthearted trip back to the Wild West and experience a comedy, western murder mystery at the Texas Star Dinner Theater in historic downtown Grapevine. The evening includes a three-course dinner with a choice of entree and dessert as well as an award-winning comedy murder mystery. 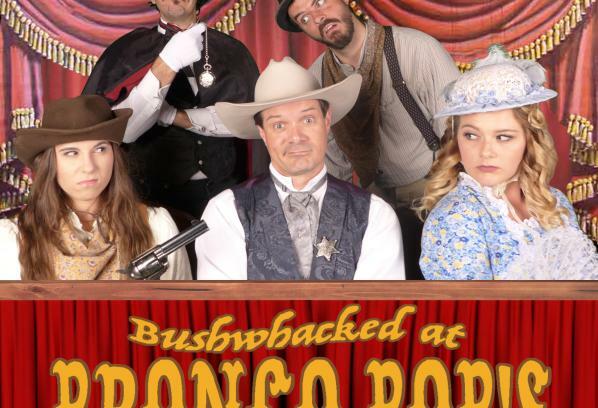 January 18 – November 16, 2019 features the newest show, “Bushwhacked at Bronco Bob’s.” Bronco Bob may be gone, but no one is missing him. Could one of his own cast members have decided it was time for Bronco to take his final bow? Maybe the diva in distress, Penelope Pureheart, wanted to see her name in lights? Or perhaps the hypnotic Professor Harry A. Pitts decided to make Bronco magically disappear? Surely the love-sick star of the show, Annie Oaktree, didn’t get trigger happy? Is it possible Smitty, the stagehand, stable hand, and understudy, is smarter than he seems? Hang on to your popcorn and peanuts, cause you’re in for a hilarious Wild West Show like you’ve never seen before! Tickets are $59.95 + tax per person. (*Prices may vary for special performances or holidays such as Valentine's Day. Please check website for any special event pricing.) TripAdvisor "Certificate of Excellence" 5 Star Rating Fort Worth Weekly Reader's Choice "Best Theater Troupe" Texas Meetings + Events Magazine "Best Entertainment in Texas"
Description We can travel our show to any venue including Friday and Saturday nights. Private Murder Mystery dinners are also available during the week.